REVIEW - Spectra - Use a Potion! I love arcade style racing games where the aim is to race through twists, turns and obstacles in order to achieve the highest score possible. Believe me, I’ve spent many hours on classics like ‘Outrun’, racking up stupid high scores and just enjoying the simplicity of it all. I’m also a fan of retro vibes to games, be it a throwback to 16-bit sprite based games or, in this case, a nod to 8-bit graphics. Baring this in mind you’d think Spectra, an 8-bit styled arcade racer from developers Gateway Interactive, would be perfect for me. Unfortunately though the game doesn’t manage to deliver that classic arcade racing experience I was hoping for. 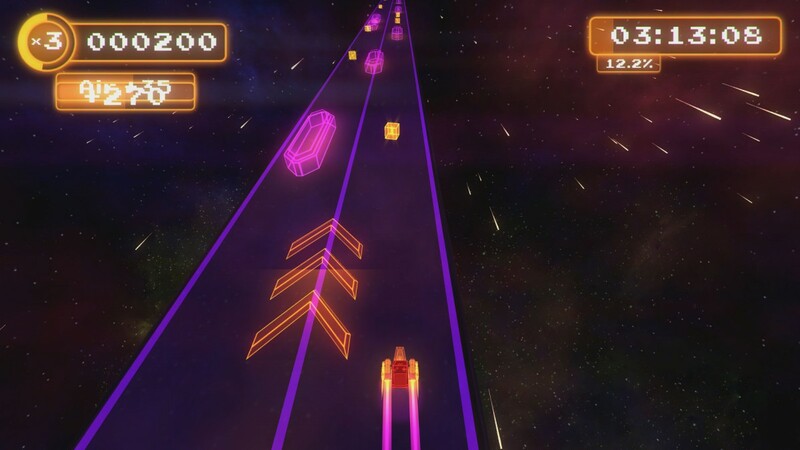 The core gameplay of Spectra is focused on racing along procedurally generated tracks, each track generated based on the music tune beating away in the background. You navigate constant twists and turns whilst trying to avoid any obstacles that come your way, focusing fully on trying to build as high a score as possible. You build your score by collecting small yellow cubes – collect them in quick succession and your score combo will build up, eventually adding to your total score. There are boost pads that will add a multiplier to your score too; they also make your ship travel at a much higher speed. Collide with an obstacle and that score combo you’ve built up is lost – it’s very much a case of risk versus reward. One aspect which Spectra gets spot on is its soundtrack. Chipzel, the musician behind the fantastic soundtrack to ‘Super Hexagon’, delivers again with the fantastic accompanying pieces to the fast paced racing. If you are a fan of pulsing chip-tune beats then you’ll appreciate everything on offer in Spectra – it’s not often that every piece of music in a game is great but this really is one of the exceptions. My particular favourites were ‘Formed in the clouds’, ‘Only human’ and finale piece ‘Sonnet’. Of course, with music being so important to the game with the tracks being procedurally generated based on the tune of the music, it was one department where Spectra really had to deliver. It’s unfortunate then that despite the music being great I didn’t fully notice it’s effect on the procedurally generated tracks with each track in the game managing to feel the same. There’ll be times when you might come across a ton of obstacles or face long bends, but it’s constantly the same. I don’t think the game does itself any favours by having the same backdrop and colours on each track. Unfortunately I couldn’t help but to feel I was racing on the same track throughout my whole experience with the game. Navigating the tracks isn’t always a breeze either, especially when trying to avoid obstacles. The game throws so many your way on some of the narrow paths that it’s almost impossible not to hit them – especially when the controls can often feel quite unresponsive. You never seem to be able to make the precise movements that you want to – it’s all the more frustrating when you consider that a collision causes you to lose a score combo that you’re building. Some collisions cause your ship to completely bounce around the track too, throwing your co-ordination into disarray and forcing you off the track. This happened to me on a few occasions and the lack of control had me feeling that sometimes maybe it wasn’t quite my fault that I failed that last track on 90% again. I appreciate the developers are just trying to add a bit of challenge to the game, it just isn’t fun trying to manoeuvre around the tricky obstacles. Criminally there are no leaderboards in the game. It almost makes the high scores you rack up pointless with no one to compete against. 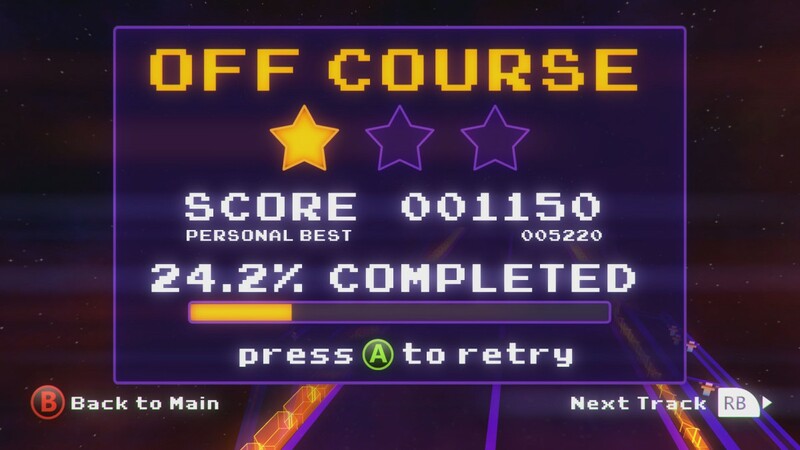 Sure you can challenge yourself to beat your own scores, or even push yourself with the hardscore difficulty mode you unlock when you’ve completed the ten tracks the game offers you, but there’s no real fun in that. Graphically Spectra manages to shine. It’s tribute to 8-bit style graphics is fitting with it’s simplistic style and bright neon lights. It is certainly pretty to look at and suits the style of the game. Unfortunately though, like most other aspects of the game, it suffers with a lack of variety. Everything looks the same. You always have the same space scene background, the same colours on the track and the exact same ship model throughout. Even if the backdrop or track colours changed a bit – a bit of variety would have at least added a bit of diversity between the already indistinguishable tracks. Spectra was a game that I really wanted to enjoy more than I did. I’m a fan of the simple arcade racers and the style and aesthetic of the game looked great. Unfortunately it didn’t deliver, with each procedurally generated track not only playing the same way but looking it too. The lack of leaderboards on a score-driven game is also very frustrating; there’s almost no extra incentive to keep playing after completion. Whilst there is an addictive nature to the gameplay it does start wearing thing by the time you’ve finished with the ten tracks available in the game. The graphics of the game do have a pretty, nostalgic look to them but again a lack of diversity lets the game down. The only really redeeming quality the game has is its amazing soundtrack, managing to shift the game from feeling very lacklustre to just an average game. It’s a shame though – I feel with a bit more creativity Spectra could have been a great game. 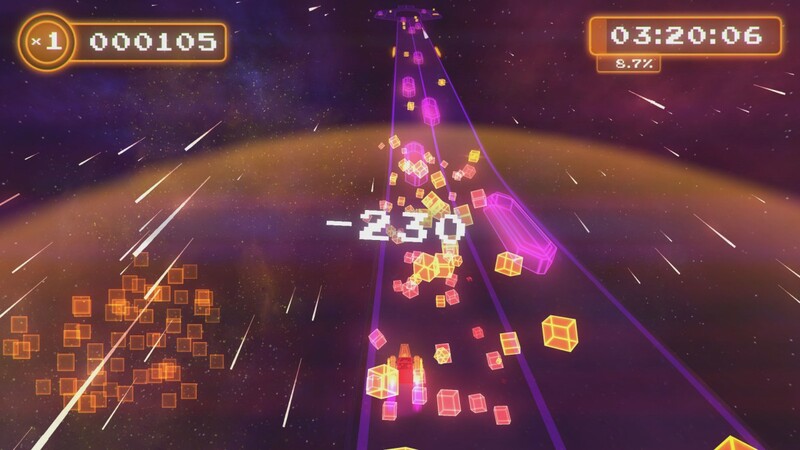 You can get the game for a pretty low price point so if you want a quick fix of arcade racing then sure, give Spectra a try – even if it’s just for the soundtrack. Otherwise though I’d recommend sticking to the classics for your arcade racing fix.